Difference between revisions of "Newark Earthworks"
In the vicinity of Newark, mile after mile of embankments, circles, and other geometric figures, parallels, lodge-sites, and mounds, covering an area of more than four square miles, amaze the archaeologist and curiosity seeker alike as they spend hours and days in traversing the ground in every direction, constantly finding something worthy of investigation and description. The Newark Earthworks were the largest set of geometric earthworks ever built in Ohio. They were constructed by the Hopewell culture (100 B.C. to 500 A.D.) of pre-contact American Indian people -- a designation sometimes referred to, by archaeologists, as "pre-historic", though pre-contact American Indian groups certainly *did* possess a history. Originally, the earthworks included a great circular enclosure (the Great Circle Earthworks), another slightly smaller circle that was linked to an octagon (Octagon Earthworks), and a large, nearly perfect square enclosure (Wright Earthworks). In addition an oval earthwork surrounded a dozen conical and loaf-shaped mounds. All of these structures were connected by a series of parallel walls. There were many smaller circular enclosures and a scattering of other mounds and pits. On the opposite bank of the Licking River's South Fork, another square enclosure and an oval earthwork encircled the top of a hill that overlooked the vast maze of geometric enclosures. The complicated array of monumental earthworks caused 19th century archaeologists Ephraim Squier and Edwin Davis to despair that it was "impossible to give anything like a comprehensible description of them." Over the years, the growth of the city of Newark destroyed many of the Newark Earthworks, but the Great Circle and the Octagon earthworks are major elements preserved by the efforts of interested local citizens. The surviving parts of the Newark Earthworks are recognized as a National Historic Landmark. In 2006, the State of Ohio designated the Newark Earthworks as "the official prehistoric monument of the state." In 1992, Dee Anne Wymer, archaeologist with Bloomsburg University in Pennsylvania, joined with the then-Ohio Historical Society (now Ohio History Connection) archaeologist Bradley Lepper, to excavate a trench through the Great Circle. The project had two main goals: 1) to learn how the Hopewell culture built the embankment, and 2) to find samples of charcoal to use for radiocarbon dating in order to determine the precise age of the earthwork. The archaeologists discovered different layers within the earthwork that showed the different stages in the construction of the enclosure wall. The deepest level was a dark brown soil layer representing the original ground surface on which the ancient people walked. A number of clues proved the land, at the time the Hopewell culture built their earthworks here, was a prairie. This would have made it easier to design and build the complicated earthworks. A sample from this soil layer returned a radiocarbon date of 160 B.C. (plus or minus 80 years), or about 2,100 years ago. This means that people of the Hopewell culture began to build the Great Circle sometime after 160 B.C., but exactly how long after is not known. The first stage of construction was the building of a circle of small mounds. The single mound cut through by the 1992 excavations was made of tan-colored silt. In the second stage of construction, the builders dug a ditch inside the circle of mounds and piled up the dark brown topsoil on top of, and in the gaps between, the mounds. This buried the circle of mounds under a dark brown circular enclosure. In the final stage of construction, the builders dug deep pits nearby and used the yellowish-brown earth from deep underground to cover the inside of the circular enclosure. At the end of this stage, the outer surface of the Great Circle would have been dark brown, but the inside surface of the circle would have been bright yellowish-brown. Undoubtedly, these colors meant something important to the ancient builders. Unfortunately, we may never know the particular, special meanings they attached to them. "Eagle Mound" is a group of connected mounds located at the center of the Great Circle Earthwork that some believe is an effigy mound built in the shape of a bird in flight. During the 1800s, some unknown persons dug into Eagle Mound probably looking for treasure. The only information we have on what they found is a few references to a stone "altar" with charcoal, ash, and burned bones found six feet beneath the center of the mound. The bones may have been human, in which case the "altar" may have been a crematory basin. Alternatively, they might have been animal bones and represent an offering or the remains of a celebratory feast. Emerson Greenman excavated Eagle Mound for the Ohio State Museum (now the Ohio History Connection) in 1928. He discovered the remains of some sort of large structure beneath the mound. The evidence for the structure was a rectangular pattern of postmolds (stains in the soil showing where a prehistoric post had been set into the ground). The structure would have been nearly 100 feet long by 23 feet wide. Greenman also found a clay basin about ten feet long by five feet wide and about five inches deep built into the floor near the center of the structure. Greenman did not find any bones or ashes in the basin, but it might have been another “altar” where the ancient people cremated the bodies of their loved ones. The structure beneath Eagle Mound was likely a special house where Hopewell shamans or spiritual leaders conducted ceremonies. Some of the ceremonies probably involved preparing the honored dead for burial. When the ceremonies were over, the people took the wooden structure apart and built a mound over the remains of the place. The large loaf-shaped mound located along the southeastern edge of the large circular enclosure at the Octagon Earthworks has been called the "Observatory" for many years simply because it provided a convenient observation platform for visitors to the earthworks. 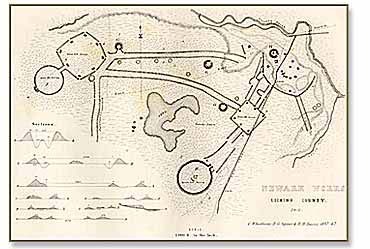 Ray Hively and Robert Horn, professors from Earlham College in Indiana, found that the name was highly appropriate, since the Octagon Earthworks served as a kind of ancient observatory. If you stand on Observatory Mound and look straight down the set of parallel walls that connect the circle with the octagon, you are looking at the point on the horizon where the moon rises at its most northerly position. This alignment happens during a short span of time every 18.6 years. Some early antiquarians thought that the Observatory Mound once had formed an archway opening into the circle, which had collapsed over the ages. One of the earliest documented archaeological excavations conducted at the Newark Earthworks was undertaken to test this hypothesis. On July 4, 1836, the Calliopean Society of the Granville Literary and Theological Institution (now Denison University) celebrated Independence Day by digging into the southwest side of the Observatory. They discovered no evidence of a collapsed arch, but the Calliopean Society excavators found that the outer surface of the Observatory originally was faced with limestone slabs. In 1994, Moundbuilders County Club, which has leased the Octagon Earthworks since 1910, decided to renovate and enlarge the maintenance building located inside the Octagonal enclosure. Ohio History Connection archaeologists investigated the area prior to this work. They discovered the remains of a large pit, six feet long by more than two feet wide, filled with large pebbles of limestone. There was a postmold at the center of the pit. Radiocarbon dates on soil from both the gravel-filled pit and the postmold indicate this feature was dug and used between about AD 250 to 390. The post may have been part of a series of posts used to lay out the earthworks so they would be properly aligned to the rising and setting of the moon. Alternatively, since it was located at one of the gateways of the Octagon, it simply might have been a signpost on which some important symbol could be hung. Lepper, Bradley T. "The Newark Earthworks: Monumental Geometry and Astronomy at a Hopewellian Pilgrimage Center", in Hero, Hawk, and Open Hand: American Indian Art of the Ancient Midwest and South, edited by Richard V. Townsend and Robert V. Sharp. Art Institute of Chicago and Yale University Press, 2004. Hively, Ray and Robert Horn. "Geometry and Astronomy in Prehistoric Ohio," Archaeoastronomy, Volume 4, S1-S20. Supplement to Journal for the History of Astronomy, Vol. 13, 1982.